Today these banks were cleared of rubbish by the Greenford to Gurnell Greenwayers. Items included one bicycle wheel, a large umbrella, a heavy piece of mangled metal (origins unknown), numerous cans and bottles, around 10 golf balls and much glass and plastic with sharp edges. Some 17 bags were filled during the course of about two hours. Hopefully it is now safer for both people and dogs to walk the area (but of course take care, since there still may be stuff there that could cause injury). Here are six of the volunteers posing! 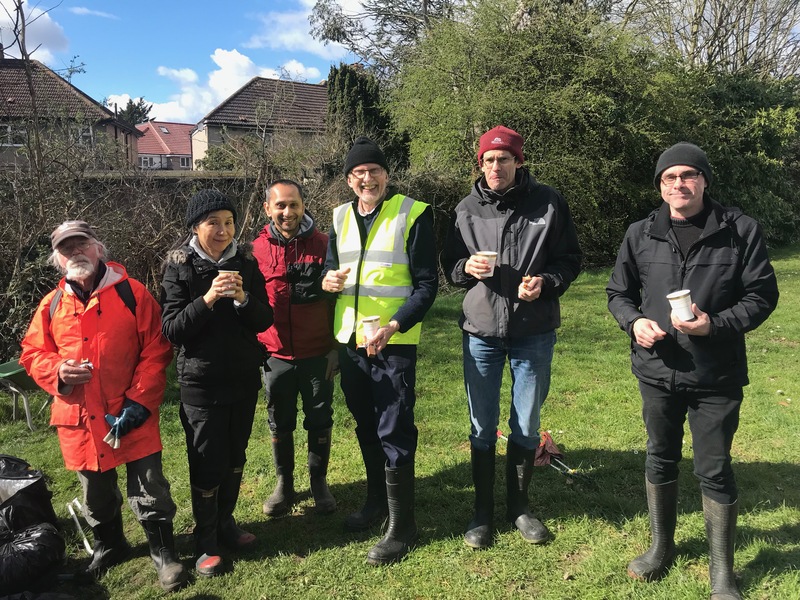 The next event will be April 14th (Sunday) at 13.00 when they will tackle the river Brent itself, in one of its more challenging areas. Meanwhile, if anyone reading this knows more about the streams contributing to Costons Brook and their sources, do tell. Henry, I’m so sorry you weren’t in the photo (because you were taking it). You are, of course, one of the Magnificent Seven who turned up to do this momentous task, for which many, many thanks. Previous PostPrevious Early spring in the Park, 2019.